Yes, it's expensive. Yes, my life is worth it. My ex may disagree. 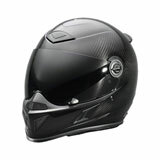 This helmet not only looks great, but is very lightweight. My Oakley goggles fit great on my face inside as well. Ventilation is awesome too. Fits snug, not tight. I can wear it all day.